If I had to pick a favourite vegetable the broad bean would be very near the top of my list. Not only a proud harbinger of summer, this protein and vitamin rich vegetable can also be transformed into a wonderful, sweet, emerald, buttery delight by the patient cook. The variety I grow on the Circus Garden (my allotment plot) is called superaquadulce, which in my experience not only produces lots of lovely beans but is also the hardiest and earliest variety of this vegetable. I plant it out in November, when most vegetables have gone or are in decline, and I can often, as now, begin to harvest the beans before the onset of the annual blackfly invasion. Blackfly (a misnomer – they are in fact black aphids) are an unwelcome visitor to any vegetable patch. 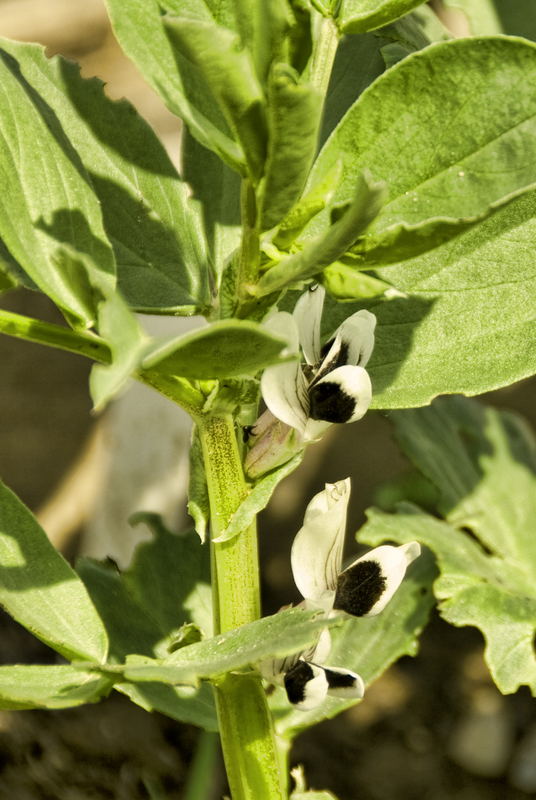 They find the growing tips of broad bean plants particularly irresistible and as the weather warms up they can be found in long, sticky clusters, feeding away on the plant’s sweet sap. And wherever you find these clusters of blackfly aphids you will also find, not far away, a group of busy ants, running up and down the plant stems. This is because the ants are “farming” the aphids for honeydew, a sweet sticky substance that the aphids excrete and which the ants love. Blackfly does not destroy a broad bean crop, and there are some very simple organic methods for keeping blackfly under control. My personal method is the simplest of all – I just spray them off the tips of the plants with a jet of water from my hose. I know that the blackfly will soon return but, frankly, as long as I get to harvest my beans I can live with that. I also grow plants nearby that attract the blackfly’s natural predators, hoverflies and ladybirds: dill, fennel, lavender, lemon balm and marigolds. Some gardeners, like my neighbouring plot holder, who first coined the term “Circus Gardener” as an insult about me and my organic methods, prefer to use chemical controls to deal with the blackfly problem. One of the most prevalent of these chemicals is imidacloprid, which belongs to a class of chemicals called neonicotinoids. How neonicotinoids work is by attacking the central nervous system of the blackfly, resulting firstly in paralysis and then death. Unfortunately neonicotinoids are not sophisticated enough to kill only blackfly. Any insect coming into contact with these chemicals will be similarly affected. In particular, neonicotinoids are now closely linked to the alarming and sudden decline in bee colonies across Europe and North America, a phenomenon known as colony collapse disorder. Despite concerted opposition from pesticide manufacturers, and – shamefully – the UK coalition government, the European Union will be introducing a two-year restriction on the use of neonicotinoids later this year, to allow further research to take place. Conservationists regard this as a vital breathing space, but much more needs to be done in order to promote and defend our pollinators. That is because Neonicotinoids are not the only factor implicated in the estimated 32% fall in our bee population over the past six years. Climate change, which ironically may well be behind the very cold start to this year, has certainly not helped, as it causes the bee’s life cycle to be “out of synch” with the flowers upon which it depends. Even more damaging are the cumulative effects of aspects of commercialised farming, in particular monoculture and the destruction of hedgerows. These have steadily eroded year-round sources of food for bees. Broad beans are capable of self-pollinating although, as Charles Darwin once demonstrated in a famous experiment, the yield without the help of insect pollinators is a small fraction of the yield with them. So it has proved on my allotment plot. I spotted my first bees only a week ago, and their previous absence has had a big impact on the number of pods on my broad bean plants this year. It is claimed that Albert Einstein once said “if the bee disappears from the surface of the earth, man would have no more than four years to live.” Whether he actually said this or not, it is a fact that much of our farming relies heavily on bees and other pollinators. To lose bees altogether would be literally catastrophic to life on this planet. What can we do to help? Well, however small the growing space you have available, grow some plants – preferably a range of plants – that are rich in nectar, such as honeysuckle, lavender, lilac, forsythia, fuschia, Philadelphus (mock orange) chives, sage, rosemary, pansies, clematis and Californian poppies. Currently one of the areas where the bee population seems to be bucking the trend is London, and that is directly due to the wide variety of plants grown throughout the year in urban window boxes, allotments, gardens and patios, providing a steady supply of nectar. London’s experience shows that on an individual level we really can make a difference. Also, have a look through your garden sprays and dispose of any that contain neonicotinoids (they will have labels such as “Bug Killer”, “Bug Attack”, “Grub Killer” or “Vine Weevil Killer”). Finally, you can take steps to protect your own health as well as helping to protect bees and other beneficial insects by supporting organic growers and only buying certified organic produce. As if the bee does not have enough to contend with already, a deadly bee parasite, the varroa mite, has recently arrived in the UK, having rapidly spread across the globe. In Hawaii, where it was first discovered, it has already wiped out two thirds of the island’s hives. The only thing of which we can be certain is that our bees face an uncertain future. OK, away with the soap box now, on with the stripey apron and into the kitchen. This recipe might seem more complicated and time consuming than recent posts, but it is really not that difficult if you follow the steps carefully and, believe me, it is well worth the effort. It’s a dish that is inspired by the cuisine of the Middle East and it simply bursts with layers of complex, delightful flavours. A glance at the recipe will reveal a few “exotic” ingredients – preserved lemons, barberries, sumac and zhug. These days preserved lemons and sumac are available from most supermarkets and the other ingredients are obtainable from Middle Eastern grocery stores or on-line. If you can’t track down barberries use the same quantity of sultanas. You can make your own zhug spice mix, as I have done in the past, but for this particular dish I used the excellent zhug and spice mix sold by Steenberg Organics. 2. For the lemon zhug, blend the lemon flesh, juice and peel in a blender. Pour this mixture into a small pan, add the sugar and heat gently, stirring to dissolve the sugar. Once the sugar has dissolved boil rapidly for two minutes. Remove from the heat and stir in the zhug. leave to cool slightly and check for taste. The lemon zhug should surreptitiously sweep you up in wonderful waves of sweetness, sourness and heat. Leave to cool in the pan while you get on with the rest of the preparation. 3. Now for the tomatoes. Halve them and place on a baking tray. Sprinkle evenly with the olive oil then the sugar, cinnamon and salt. Place in the pre-heated oven and leave to cook slowly for an hour or so, until the tomatoes are soft and beginning to char slightly on the edges. Remove from the oven and set to one side until you are ready to plate up. 4. While the tomatoes are slow roasting we can prepare the pilaf. Bring a pan of water to the boil, add the broad beans and return to the boil for two minutes. Immediately remove from the heat, drain the broad beans and plunge into a bowl of ice cold water. This next bit is where patience becomes a virtue. One by one you need to slip the broad beans out of their skins. They should slip out fairly easily but this is a long and laborious task so you might want to listen to Radio 4 or put on some music while you’re doing it. When completed, put the skinned broad beans to one side (the skins from the broad beans can go into your compost waste). 5. Place the barberries in a pan, add the stock and slowly bring to the boil over a low heat. As soon as it begins to boil, remove from the heat and pour it over the bulgur wheat. Cover and leave. The liquid will be absorbed by the barberries and the bulgur wheat. 7. Heat the oil in a frying pan. Add the onions and fry over a gentle heat until soft and sweet. Remove from the heat, stir in the broad beans, preserved lemon peel, cinnamon, cumin, sumac and olives. Add this mixture to the bulgur wheat and mix it all together. Leave to cool before adding the parsley, mint, pine nuts and lemon juice. Stir again and taste. Add sea salt and black pepper if you think they are required. 8. Just before serving very gently reheat the lemon zhug as it will have begun to set. To serve, pile a few spoonfuls of the pilaf onto the centre of the plate. Surround this with six tomato halves and finally drizzle the warm lemon zhug around the outside. I share your concern about the bees and think that the trend towards mono-culture is another problem. This year I have had Miner Bees buzzing round my garden, they seem particularly excited about the flowers on my Blueberry Bush and have made their solitary nests nearby in the ventilation strips in the brickwork of my house. Mason Bees get a bad press, people think they damage property but they usually nest in existing vertical gaps and don’t do any harm. They are very good pollinators too, so I’m happy to have them as lodgers. Enjoyed the blog again Steve. What about writing about the demise of proper English Strawberries? The old and tasty varieties like Cambridge Favourite have been replaced by the heavy cropping, fragrant but tasteless Elsanta, which has such a high water content they turn to mush as soon as you look at them. ……and don’t get me started about those horrors from Spain and Morocco that arrive in the supermarkets at Christmas. Pale imitations Yuk! Hi Helen. Thanks for your great comments. I’m planning to write about strawberries in next week’s post as one of the varieties I grow – “Buddy” – is now in fruit. I share your exasperation at the commercially grown strawberries generally on offer these days, where the key characteristics the producers and retailers are looking for are transportability and longevity rather than taste. But there are still some lovely, flavourful varieties out there which are easy to grow, and nothing tastes better than a perfectly ripe, freshly picked, home-grown strawberry eaten on a warm summer’s day! You are such a chef! Please do a pop-up restaurant sometime and I’ll come (I’m in mid-Wales so not so far) — or I’ll be your sous-chef!!!! I work with Creative Nature Superfoods. Came across your work through Suma. We really like what you’re doing with your website and would be interested in sending you product and doing a collaboration? Can you please send us an email: office@creative-nature.uk.com.